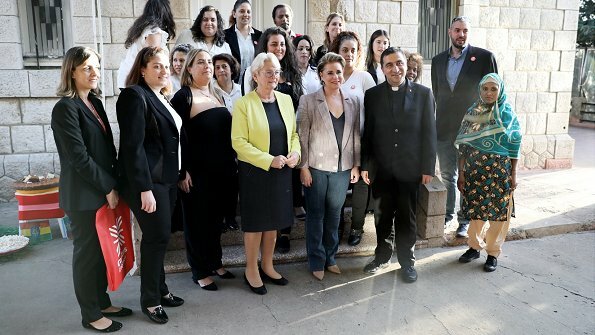 On the second day of her humanitarian aid visit to Lebanon, Grand Duchess Maria Teresa of Luxembourg visited Taanayel town which is connected to Beqaa Governorship. The Grand Duchess firstly went to the headquarters of Arcenciel Foundation in Taanayel. Arcenciel Foundation is a nonprofit humanitarian aid organization. The Duchess then visited the Bar Elias refugee camp in Bekaa Valley and met with beneficiaries who receive education and microfinance support from Arcenciel. 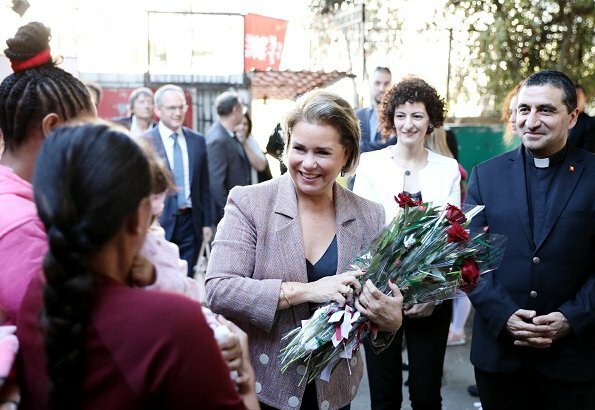 The Grand Duchess then visited a safe house where sexual violence victims live. M Therese ziet er hier weer fantastisch uit, mooi kapsel, magerder,vriendelijk. After all this work she is trying to sneak back into a square boxey coat - please no. Her work and personality are commendable. MT looks very good in jeans! I'm so use to seeing her in Eli Suab, etc. These jeans are very sliming on her. And is it just me or are all the royals suddenly hugging people now? Has a certain young Duke and his bride now made it "fashionable okay" for every royal house? LOL. Love everything on her today.The new hairstyle make her looks so young and the smile it is fantastic. She interacts so well with the children.Nice to see her on a solo tour overseas. Love M T but don't like anything about this outfit. Sorry. I truly hate the buttons of her jacket, both because of how they are arranged (too 80s for me) and because of the white colour which cheapens the look tremendously. Other than that, Maria Teresa looks good.